The Y table is the oldest element of the system. 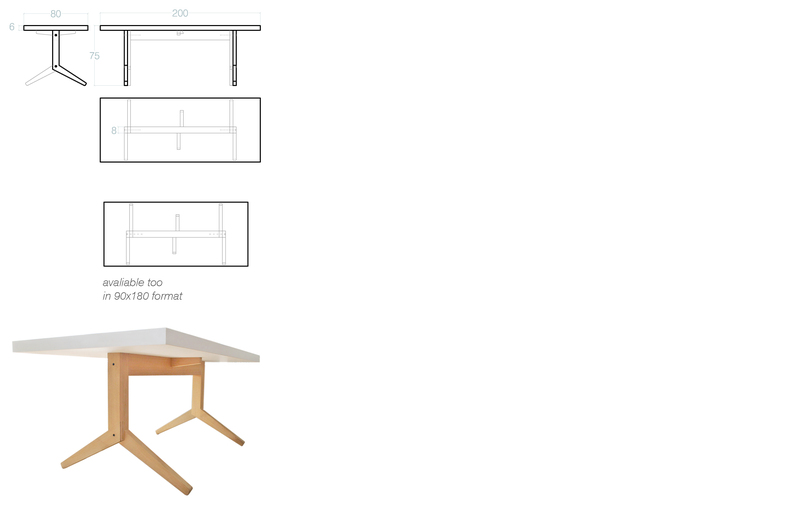 The last stages of the R house design called for an all-purpose dining table that could be placed either in the centre of the room or to the side. As a boundary element, the table can be placed next to a wall bench and along modular kitchen elements. The recessed “Y” shaped legs of the table allow us to sit at both ends and, most importantly, allow us to slide around the corner and sit on a wall bench without having to overcome any obstacle. When placed in the middle of the space, the Y table appears like a floating prism whose legs, lacquered or raw, interlace with those of the K chair. The surface is the ideal staging of the lunch ritual: a thick platform, laminated and edged, ready to be grabbed at the peak of the conversation.